Who is paying the true cost in the fashion industry? We start everyday with waking up, having something to eat and putting on some clothes. These are elemental parts of our everyday life. But how many times have we thought about, where our clothes come from? Who is making our clothes? What happens with clothes after we are tired of them? The True Cost movie is putting together pieces of information to show us the broad picture which gives us answers to these questions. It connects the thoughts we might have about the production and shows us the real, untold story. The increasingly trend to bring new styles into stores on a weekly or even daily basis has created a buy-and-throw away culture. In the U.S. around 40 kilogram of textile and clothing are thrown away by a single person on average each year. This is forecasted to add up to as much as 16 billion kilogram in 2019. Europeans are discarding 5.8 billion kilograms of textile every year, making it at on average 8 kg per person. The business model of fast fashion clothing companies is built on low quality and high volume production. Fast fashion has increased the speed at how fast new clothes need to be produced. This puts a lot of pressure on the whole supply chain, which often starts in countries like Bangladesh or Cambodia. Workdays of 14 hours, with salaries of around $2 a day in low quality and hazardous environments are the standard for the mostly young women. In 2013 a factory in Bangladesh which produced for U.S., Canadian and European clothing labels and retailers collapsed. Although workers had previously highlighted cracks in the building walls they were forced into the building on a Wednesday morning on April 24. “The collapse of the Rana Plaza building is, to date, the deadliest disaster in the history of the garment industry worldwide.” The collapse killed more than 1100 people. Over 2500 were injured and many of them needed to have amputations. In India and even the U.S. where a lot of cotton for the textile industry is produced the land is contaminated through fertilizers. They have not only harmed the soil, basically making it dead for vegetation, but the hazardous fertilizers have also an impact on the people working on these lands. In India women in these areas give birth to disabled children at a much higher rate compared to any other region. They have no money to give their children proper health care and are forced to simply wait for their children to die. They have no money since they need to buy the seeds as well as the hazardous fertilizers from the same big corporation and put all their hope in a fruitful harvest. In case of failed harvests, the farmers often comitt suicide. In the US farmers working on fertilized land are diagnosed with cancer more often than other people. Throwing away cheap and low quality textiles? What happens with these clothing products, that have are poor quality and are contaminated with the hazardous fertilizers? In the U.S. about 15 percent of the textile which is thrown away is recycled. In the EU the number is slightly higher with 25 %. However, the rest ends up in the landfill. This not only contributes to the increasing demand for raw materials for fast fashion, but the contaminated textile continuous to harm the environment where it ends up. It does so for 200 years since this is the time textile needs to biodegrade completely. The longing for expressing our individuality and uniqueness through the clothes we wear is strong. But if we cannot buy less, we as individuals can rethink our consumer behavior. Can a T-shirt that costs 4 € be produced in a way that everybody involved in the production process gets a fair share for their work while the retailer is still making a profit? Another option is to buy from sustainable brands. There are a lot of young companies which make appealing clothing, like Patagonia, Armed Angels or People Tree to name just a few examples. Their products are of course more expensive, but are produced in a fair way and have a higher quality, so that they can be worn more often. In order to reduce textile waste at all, we can donate clothes we do not want to wear anymore. There are tons of Non-governmental organizations (NGOs) as well as local institutions that are happy to take our clothes for people in need. Examples are Emmaus, Red cross or Skåne Stadsmissionen (Sweden). Most of these communities also have second-hand shops were they sell the donated things for small money. Originally invented for people who could not afford expensive clothing it has become popular to a diverse segment of buyers. Going to a thrift shop is always an adventure, the pieces are all unique and sometimes a trip down memory lane. More arguments why a trip to a thrift shop is a good idea are highlighted in this article by Lifehack. The actions of an individual, although they can make a difference, seem small compared to the influence of big corporations, their managers, shareholders and banks, which are only focusing on profit. The true cost of fashion is paid by the people at the beginning of the supply and production chain. But the price for the influence on the environment is paid by us all. 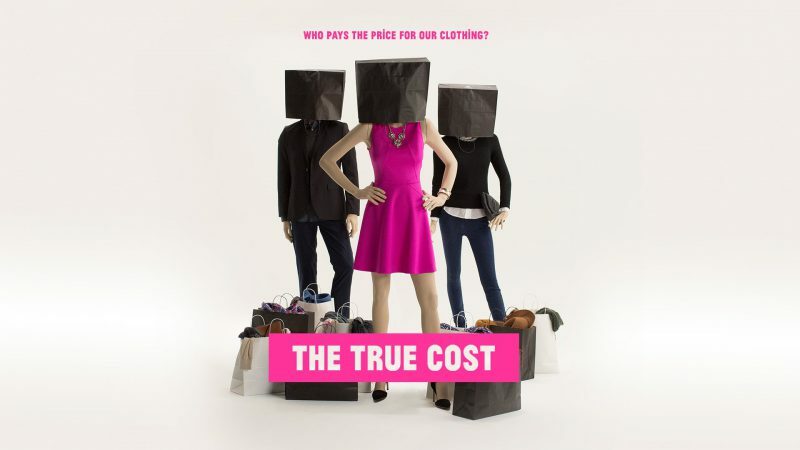 The true cost movie makes the claim that globalization made the promise that people in developed countries get cheap products and people in less developed countries get jobs and the opportunity to work themselves out of poverty. One side of that promise has been made real. However, it seems like we have forgotten about the people involved in the outsourced production. One way to bring them back to our attention is to see the human being involved and ask ourselves is that the way we want to treat people? Director Andrew Morgan’s motivation to shoot the film is based on his desire to explore where our clothes come from and who is involved in making them. He sees The True Cost as an invitation that there is something really important going on in the world which few people have considered or are actually aware of. His message is that there are physical hands involved in the production of the clothes we are wearing right now. The lives involved matter. It is an invitation to all of us to create the world we want to live in. Which history do we want to make? The True Cost Movie is available on Amazon Instant Video. Further screening options can be found at the True Cost website.